This entry was posted in Academic achievements, Academics, Students and tagged fulbright, scholar on March 26, 2012 by Wire Eagle. 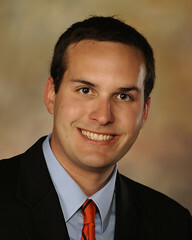 AUBURN – Paul Bergen, a senior in Auburn University’s College of Sciences and Mathematics double majoring in microbiology and German, has been awarded a Fulbright Scholarship to study in Germany for the 2012-13 academic year. At the Technical University of Munich, he will continue to pursue his research in microbiology. A four-year member of the Honors College with a 3.97 overall grade-point-average in two demanding majors, Bergen is Auburn’s fourth consecutive Fulbright scholar, following Rebecca Ludvigsen, Germany, 2009, Helen Hunter Robertson, France, 2010 and Kristen Snow, France, 2011. His achievements include being selected for the Competitive Undergraduate Research Fellowship for the 2010-2011 academic year; being named a Cellular and Molecular Biosciences Summer Fellow in 2011; and being named the College of Sciences and Mathematics’ top junior for 2010-2011. He is also a recipient of Auburn’s Presidential Scholarship. For the past two years, Bergen has conducted his honors research under the guidance of Mark Liles, examining clones from a soil metagenomic library that have inhibitory activity against bacterial pathogens. Liles is an associate professor in the Department of Biological Sciences. Bergen’s work in the Liles Laboratory is the basis for his honors thesis and it is this work that he will continue to pursue under the direction of professor Wolfgang Liebl at the Technical University of Munich. The Fulbright Scholarship Program is a highly selective, merit-based award designed to increase mutual understanding between the people of the United States and the people of other countries. Founded in 1946, the Fulbright Program competitively selects graduating seniors and graduate students who plan to conduct research, or exercise their talents abroad.